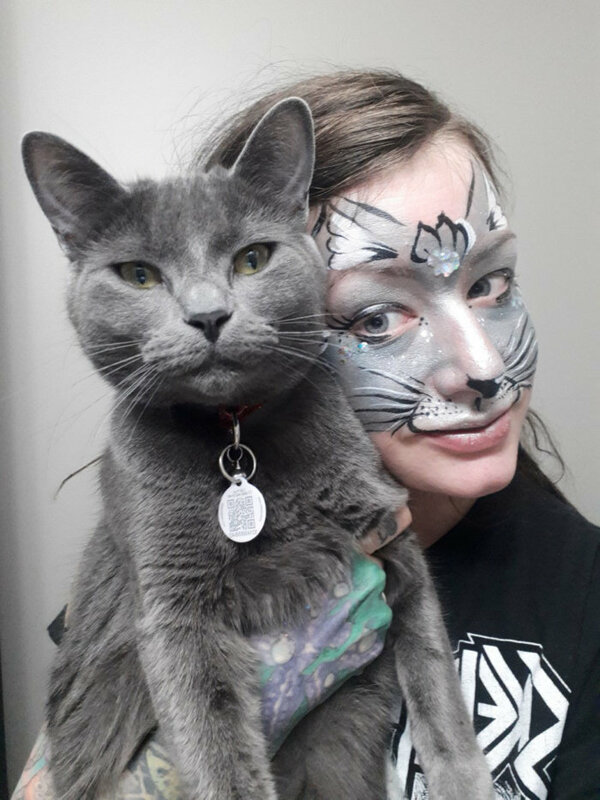 At the June 1, 2019 Edmonton International Cat Festival, our sponsor Painted Parrot Face Painting will be making some meowgical cat face paint creations for attendees! This face painting is included with your festival admission (but be prepared for line-ups! Face paint is always a popular CATivity at our event). 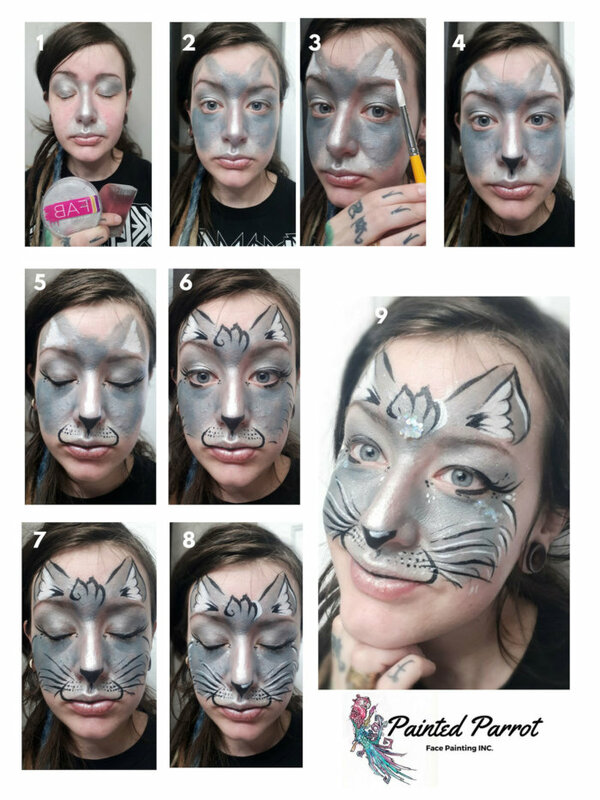 We encourage you to stop by and visit Andrea and her team at Painted Parrot Face Painting, but if you also want to come decked out with your own cat face paint design, try the steps below to recreate Andrea’s design! First off I really want to stress the importance that PROFESSIONAL COSMETIC GRADE paint is used, that (if possible) we include a disclaimer that even though acrylics say “non-toxic,” they are not FDA approved or ever safe to be used on the face or skin as they can cause horrible horrible allergic reactions. Same goes for glitter needing to be cosmetic grade, as craft glitter can scratch the face from its rough dense texture during removal or even worse get in the eye and cause serious damage or blindness since it is sharp enough to cut. At Painted Parrot Face Painting, we use professional paints, however for home DIY painters, an economic recommendation would be the brand Snazaroo, which is cheaper lower pigmented face paint that can be obtained at Michaels or Deserres. 1. Sponge your colour of choice above your mouth, along your nose, and over the eye lids: White and light greys work nicely! 8. Using white face paint and a fine brush, add some highlights around the whiskers, nose, and top of the design. Feel free to add more dots and swirls too for extra effect. The paints I used for this look: FAB Silver, FAB Gun Metal, DFX White, and Global Black. For Cosmetic Glitter I used Amerikan Pixie Paint, and holographic fire-Amerikan body art. The Painted Parrot Face Painting offers creative face painting designs, glitter tattoos, and balloon twisting for all ages! From superheros to princesses and everything in between, the Painted Parrot Face Painting has got you covered! They are available for hire for all events in Edmonton and surrounding area.